If elected, Mulcair pledged to immediately name a commissioner who would be dispatched to the region to speed up the resettlement process. 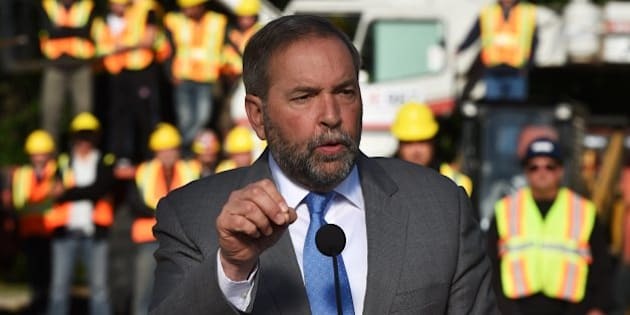 WINNIPEG — Tom Mulcair insists he would, if elected, make good on his vow to bring 10,000 Syrian refugees to Canada by the end of 2015 — even with bureaucratic barriers and his own tight, self-imposed deadline. The NDP leader's promise is even more ambitious than a new target established by the White House, which said Thursday the U.S. would take in the same number of Syrian refugees — but only over the next 12 months. Mulcair maintained that should the NDP win the Oct. 19 election, a New Democrat government would resettle 10,000 refugees before New Year's Day — a little over two months into its mandate. To get it done, he would immediately name a commissioner who would be dispatched to the region to speed up the process. The NDP plan, Mulcair added, would untangle some of the bureaucratic knots that have slowed efforts to bring refugees to Canada — obstacles he has repeatedly criticized during the campaign. "Where there's a will, there's a way," Mulcair said at a campaign stop in Winnipeg after being pressed on how he could meet the goal. "We have been saying we will meet the United Nations request for Canada to do more and, between now and the end of the year, we know that we can get 10,000 refugees here." The refugee crisis in Syria, where millions of desperate people are fleeing the war zone, has emerged over the last week as a top ballot-box issue in Canada — a rarity for matters of foreign policy. The Syrian emergency suddenly hit home for many more Canadians last week when a photo emerged of three-year-old refugee Alan Kurdi lying dead on a beach in Turkey. Some 2,500 refugees have arrived in Canada since the government began opening spaces for Syrians in 2013. In all, the Conservative government has committed to opening the doors to 11,300 people by the end of 2018. Mulcair accused Conservative Leader Stephen Harper of doing little to address the crisis. "Mr. Harper keep piling up the excuses for doing nothing," said Mulcair, who later called on Ottawa to match donations made to registered Canadian charities providing assistance to Syrian refugees. Earlier Thursday, Harper indeed hinted that work is underway to accelerate the process of refugee resettlement. The New Democrats have committed to giving to 46,000 Syrian refugees a home in Canada over four years. The Liberals, meanwhile, have promised to resettle 25,000 Syrian refugees in Canada by Jan. 1. Later Thursday, NDP spokesman George Smith said Canadian immigration experts have informed the party that its target is achievable. Other countries have welcomed greater numbers of refugees in shorter periods, Smith noted. Germany, which expects to receive as many as 800,000 refugees this year, recently open its doors to an estimated 10,000 people in one day, he added. Last week, the head of the union representing federal immigration workers told the website iPolitics that it would be "impossible" for staff to meet the year-end targets proposed by the NDP and Liberals. Marco Angeli, national president of the Canada Employment and Immigration Union, told iPolitics that public service cuts in recent years have made it impossible to process such a large volume of cases in such a short window. The NDP also said it would unveil its "fully costed, balanced fiscal plan" before next Thursday's economic debate in Calgary. Mulcair, who was in Winnipeg to announce a multimillion-dollar pledge aimed at addressing youth unemployment, has come under fire by opponents for his expensive suite of campaign promises. At a training centre, Mulcair promised to create more than 40,000 youth jobs, paid internships, and co-op placements over four years. He said an NDP government would work with the private sector and NGOs and provide up to $100 million a year to help cut the 13.1 per cent youth unemployment rate. The plan, he said, would require apprentices be hired for all federal infrastructure projects greater than $10 million. An NDP government would also provide $5 million a year in grants so that municipalities can create 1,250 apprenticeships, and crack down on unpaid internships.